In my previous post (Managing Change Logically, Imaginatively, and Actively) I outlined four steps that libraries can take to harness change. I’d like to expand on each in turn, starting with our timeless purpose. My ideas on this matter were extracted from the New England Library Association workshop Rethinking Libraries: A New Model for a New World1, during which Molly Rodgers described Wayne Library Alliance’s reinvention. She repeatedly emphasized the centrality of “timeless purpose” in the process. A “timeless purpose” is exactly what it sounds like: a reason for being which is so fundamental that it cannot be modified. In his article Change is Good—But First, Know What Should Never Change2, Jim Collins asserted that “any great and enduring human institution must have an underpinning of core values and a sense of timeless purpose that should never change.” The first step in managing change is identifying what must stay the same. We may have some notion as to what our timeless purpose is, but it is neither straightforward nor crystal clear. This is one reason why planning for change can be so difficult: our raison d’être is complex, multifaceted, and seemingly shape-shifting. We easily lose sight of slippery philosophical doctrines in the bustle of day-to-day operations. Thankfully we can always turn to ALA’s Code of Ethics3 for a reminder. I’ll spare you a full reiteration and, once again, encourage you to review it at your leisure. Suffice it to say, we all care deeply about its tenets and would not alter them, even under drastically different circumstances. Well-written mission statements hint at our timeless purpose in ways that are catchy and memorable. I welcome any readers to share your favorite(s) in the comments section below. Wayne Library Alliance documented their timeless purpose in a slightly different way. 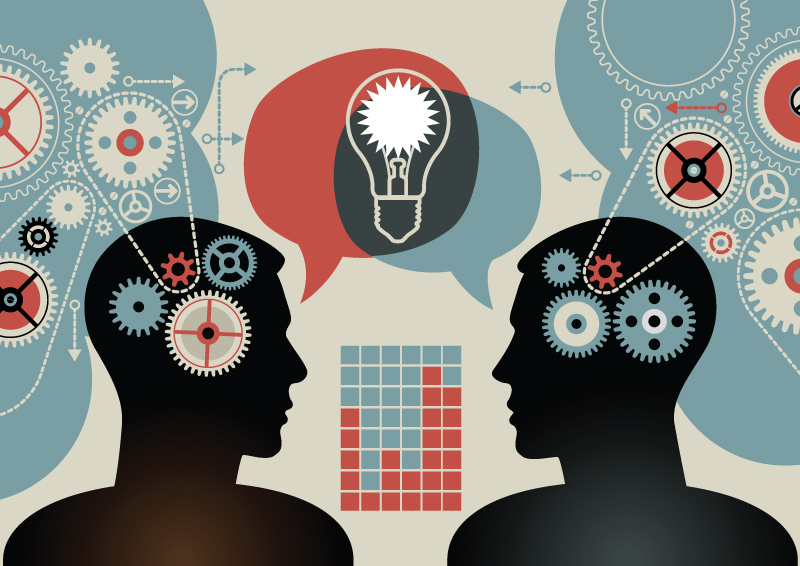 Rodgers hired two consultants – Lyn Hopper and Stephen Spohn Jr. – who, in collaboration with staff, developed a “lens” through which they could collectively envision their libraries’ future. This lens pinpointed the nexus where their core values, service strengths and community demand coalesced. They then designed a graphic representation to clearly illustrate their model, thereby making it tangible to staff and patrons (see diagram below). The graphic was affixed to the back of employee identification cards and hung on posters in their libraries. This not only kept their timeless purpose top-of-mind, but also ensured that any changes being considered would remain faithful to these permanent imperatives. 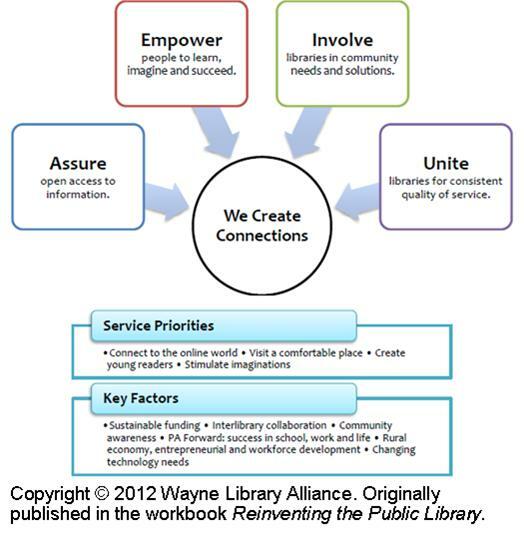 For more information about Wayne Library Alliance’s project, I highly recommend their Reinventing the Public Library workbook5 available through WebJunction. Their methodical approach serves as a model of intentional planning for libraries undergoing change. Rodgers, Molly. “Rethinking Libraries: A New Model for a New World.” (presentation, New England Library Association Annual Conference, Sturbridge, MA, October 14-16, 2012). American Library Association. “Code of Ethics of the American Library Association.” American Library Association. Accessed November 8, 2012. http://www.ala.org/advocacy/proethics/codeofethics/codeethics.